The government is discussing ways to change the VAT, heeding to the appeals of the the public by increasing the VAT threshold on the wholesale businesses subjected to the VAT, said the Parliamentary Affairs and Mass Media Minister Gayantha Karunathilake. He also said that there is an organized attempt to spread baseless rumours about the VAT to the country. He added that President Maithripala Sirisena, Prime Minister Ranil Wickramasinghe are discussing with the Finance Minister to chanege the VAT in a manner that the effect on the public was minimal. He made this observation yesterday at the cabinet briefing held at the Information Department auditorium. “Compared to the tax imposed by the Rajapaksa regime, the VAT imposed by this government was insignificant” Minister Karunathilake said. “As this Good Governance Government always listens to the public it will take measures to change certain clauses in the VAT”. State Finance Minister Lakshman Yapa Abeywardena speaking at the media briefing said that government is also considering o exempting the private Health Services sector from the new VAT amendments in order to provide relief to the people who are affected directly. He added that it was also considering to increase the amount of wholesale business VAT exemption thresh hold to Rs 3 million. 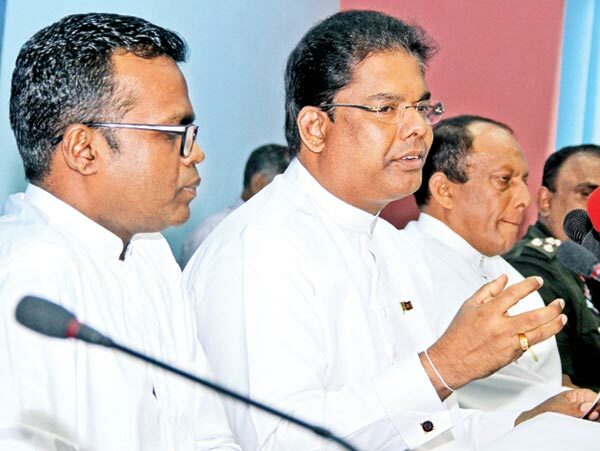 Parliamentary Affairs and Mass Media Deputy Minister Karunaratne Paranavithana, International Trade State Minister Sujeewa Senasinghe, Navy Media Spokesman Captain Akram Alavi and Military Media Spokesman Brigadier Jayantha Jayaweera also participated at the cabinet briefing.